Economia agro-alimentare/Food Economy is a triannual peer-reviewed scientific journal published by Franco Angeli Edizioni on behalf of the Italian Society of Agri-food Economics (SIEA), founded in 1996 by the then President of SIEA Fausto Cantarelli. It offers an international forum for the discussion and analysis of mono and interdisciplinary socio-economic, political, legal and technical issues, related to agricultural and food systems. It welcomes submissions of original papers focusing on agriculture, food, natural resources, safety, nutrition and health, including all processes and infrastructure involved in providing food to populations; as well as the processes, inputs and outputs involved in consumption and disposal of food and food-related items. Analyses also include social, political, economic and environmental contexts and human resource challenges. Submissions should be addressed to an international audience of researchers, practitioners, and policy makers, and they may consider local, national, or global scales. The FSTA® – Food Science and Technology Abstracts database is now indexing "Economia agro-alimentare / Food Economy" starting with the first issue published in 2017. FSTA® is an extensive specialist database in which carefully selected food and health research and information is collated, summarised, and indexed for efficient searching. It is used by researchers, industry practitioners, and students around the world to keep up-to-date with the latest findings in their fields. Selected full papers will be submitted to a special issue of Economia agro-alimentare / Food Economy. Leibniz-Informationszentrum Wirtschaft" will add the Journal Economia agro-alimentare / Food Economy to their collection. ECONIS is a reference literature source widely used by German researchers in economics and social sciences. 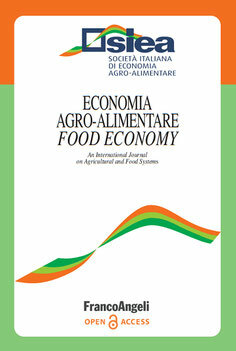 The Editorial Board of Economia agro-alimentare / Food Economy, the Publishing Team at FrancoAngeli Edizioni and the Presidential Board of the Italian Society of Agri-food Economics, are delighted to announce that the journal has been accepted in Scopus for its valuable contribution to the field of agricultural and food systems economics and policy. Depending on the completion of the necessary agreements between Scopus and the publisher, the archive of the journal should be indexed in few months. Economia agro-alimentare / Food Economy. An International Journal on Agricultural and Food Systems.